Manboobs | KDT Optometry - Excellence Is The Only Option! 1. Are you a guy or do you know one close to you over the age of 35? 2. Have you or he looked at your/his bare chest lately? 3. If so… did you see them?…The dreaded…. Obviously if you are female this is not an issue. 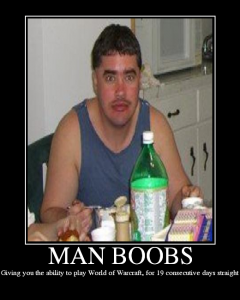 But for us men, “gynaecomastia”, often jokingly referred to as manboobs (we can thank “Seinfeld” for that) is anything but funny. From this point on, I’ll refer to it as “MB” if that’s okay by you. MB is not an age thing. It can occur at almost any time in life. However, for those of us over 35, it is more common. When you age your testosterone levels decline…and more than that the testosterone gets “weaker” due to an imbalance between it and estrogen. When you combine that with our modernized “estrogen-rich” environment that Dr. Holly Lucille frequently lectures on, you have a problem. MB is associated with lack of drive (you know what I’m talking about guys) and excess bellyfat due to the estrogen. Even more serious: Excess estrogen has been positively linked to prostate cancer. Yep. MBs are not so funny after all. Check out Dr. Lucille’s NaturaPause Audios. There is an entire audio dedicated to male menopause and natural solutions that really work. Most do not work worth a darn.